There are a lot of nonprofits doing really cool things to increase fundraising and general awareness of their work. But every so often, a charity manages to knock it out of the park with their marketing campaign. These are three of our favorite marketing campaigns and what you should take away from their success when planning your marketing strategy. To celebrate their fifth birthday in 2011, Charity:Water did something very special for all the people who helped fundraise for them. They made personalized Thank You videos for each and every person/campaign, about 250 in all. But these videos were not just generic, boring thank yous. Charity:Water chose to involve everyone in their staff to help with this project, with each video having a particular theme related to the campaign they were thanking. The campaign was especially captivating because Charity:Water allowed their staff to get creative and let their personalities bleed through in each video. We felt like we were getting a glimpse into the atmosphere of the people behind the organization, helping us feel further connected with both the people and their goal to bring water to everyone. Donors want to feel connected to the organization they are supporting, so it is just as important to show them the people and personality behind the scenes as it is to emphasize your mission. Putting a human face (or faces) to your organizations helps people feel more connected to your work. Humor is a powerful tool. Mama Hope took full advantage of the humorous-side of their important work in their video “African Men. Hollywood Stereotypes.” The video features a few African men playfully explaining how absurd the portrayal of African men in Hollywood really is. The men in this video are not the typical machine-gun toting, violence-loving, war lords we see in many action movies. They are your typical young men, who spend their time studying, playing sports and joking around. Mama Hope takes a unique approach by tackling the issues of African stereotypes and pitying using positive messaging and humor. These tools are much more effective because they help humanize the issue by making it more accessible and fun. We are not overburdened by the emotional or serious nature of the clip. Instead, I found myself laughing along with these men at the absurdity of the stereotypes and immediately sharing the video with others. This video works because of its humor. We are a culture that loves to laugh, meaning positive videos are often the ones that go viral (e.g. Gangam Style). Shining a positive and optimistic light on your important work will help new supporters better relate to your work and feel more comfortable sharing it. One of the cleverest marketing campaigns came from UNICEF, who utilized the hugely popular photo-sharing social platform Pinterest to promote their new fundraising campaign. UNiCEF’s pin vs. your average pin. 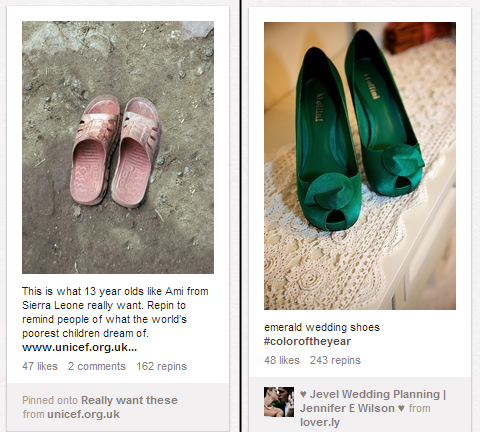 For this campaign, UNICEF created a Pinterest profile for the fictional Ami Musa, a 13-year-old girl from Sierra Leone. Like millions of other Pinterest users, Musa had a board dedicated to the things she “really wanted” and filled it with photos of various items. The only difference was that Musa’s items were not the typical materialistic items found on most people’s boards; they were instead every day necessities many of us take for granted: water, soap, shoes, etc. These pins took something very familiar to Pinterest users and stripped away the trivial nature of the platform, urging users to step back and re-think what is truly important in life. The campaign succeeded for two reasons: it was clever and original, and also it took advantage of a huge platform that has been difficult for most nonprofits to tackle. The success of the UNICEF Pinterest campaign highlights the importance of bringing your content directly to your supporters, who are not only on Facebook and Twitter. Taking risks and doing something different is also a great way to stand out from the rest of the content on social media, which often blurs together in peoples’ minds. Don’t be afraid to try something new, whether it be a new social media platform or a new approach to telling your story. It may pay off big in the end. What is your favorite nonprofit marketing campaign?